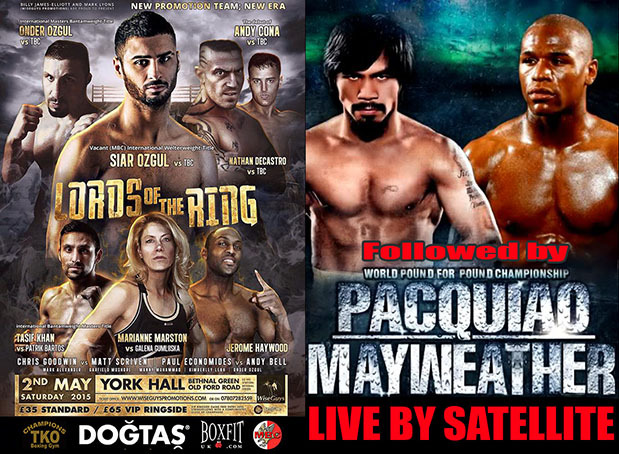 London – Wednesday, 29th April 2015 – Have you got your tickets for the Boxing event of the Century yet? If the answer is no, then promoters Mark Lyons and Billy James-Elliott may just have the perfect alternative lined-up for Boxing fans – a night of Championship Boxing at York Hall, in Bethnal Green, followed by MAYWEATHER-PACQUIAO live by satellite from Las Vegas. Kicking off the whole night of pugilistic action, sees a full card of Boxing at the famous Home Of Boxing in the Capital, including two Championship Battles. Hackney, London based Turkish unbeaten star SIAR OZGUL makes his first tilt at a title when he takes on Nottingham’s MATT SCRIVEN for the vacant MBC International Welterweight Championship. Heading up the support for the two Championship bouts sees Chester’s WBF Intercontinental Champion PAUL ECONOMIDES take on Nottingham’s GARFIELD MUSHORE in a non-championship six rounder. Champions TKO’s unbeaten Light Heavyweight prospect ONDER OZGUL takes on the highly entertaining JODY MEIKLE, from Scunthorpe, in a six rounder. Making his first visit to the Capital City will be Liverpool based unbeaten Russian star DAVID AGADZHANYAN, who will take on Czech Republic’s JOSEF REDLICH in a six round contest. Former American Basketball Star, turned professional Boxer, MANNY MUHAMMAD will also be in action against a yet to be named opponent. Making their debuts on the night are exciting young local talents ANDY CONA and DANIEL MENDES in action against each other. Siar Ozgul versus Matt Scriven, for the vacant MBC International Welterweight Championship, headlines the Mark Lyons & Billy James-Elliott Wise Guys Promotions LORDS OF THE RING event, that takes place at the York Hall in Bethnal Green, London on Saturday 2nd May 2015. Tickets priced £35 (Standard seating) and £65 (Ringside) are available on the night, or to ensure a seat buy on-line at www.tkoboxoffice.com or call the TKO ticket line on 07960 850645.